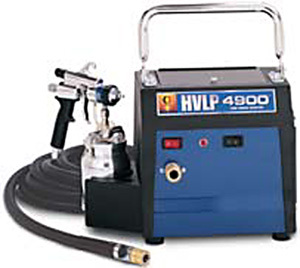 HVLP Paint Sprayer Details - Quasius Equipment, Inc.
Our Graco 4900 Fine Finish Sprayer utilizes High-Volume Low-Pressure (HVLP) tecnology to give you superior performance and fine finish results with a wide range of materials. Unlike airless paint sprayers, which are designed for high production rates, the Graco HVLP sprayer runs an air turbine to force high volumes of air through the gun at reduced air pressures. 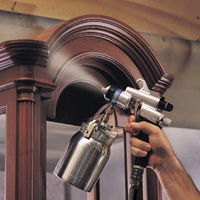 This minimizes all of the overspray and clouding of the work area typical of traditional paint spray guns. It also offers tremendous control over the finish application and minimizes runs and sags while delivering an extremely smooth and flat finish. 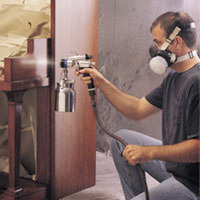 HVLP guns can be used to spray a wide variety of materials, including stains, lacquers, enamels, latex, or urethane paints. If you need to spray masonry sealers such as Drylock or any paint with any sand or texture in it this is not the sprayer for you. If you are spraying these items our Texture Sprayer would be the perfect choice for you. If you need to cover large areas in minimal time our Airless Paint Sprayer is probably better designed for that application. If you are not sure about your application please give us a call and we'll be happy to discuss your job with you and recommend the proper tool for the job.